Eve Merton’s story is unfortunately not an uncommon one but her drive, determination, inspiration and love for others is something that will live on forever. Eve was not a famous or what you would call an important person, she was a hardworking woman of Doncaster who spent 20+ years working on our own famous Doncaster Market. Eve however was never content in just doing her work and going home, she did everything she could to help others. She created a Christmas club for all the market traders, friends and neighbours, helped run Weight Watchers clubs around the South Yorkshire area, collected shopping for elderly neighbours who were unable to go themselves despite being 68yrs old herself and even founded a boys football club, initially so her sons and friends had somewhere to play but the club grew and is still running today. However in April 2009 Eve was struck down with Level 3 Ovarian Cancer at quite a late stage. The Tumour had grown to such a size it had given her the look of a 9 month pregnant woman. After a month of tests, scans, biopsies and numerous consultations, Eve was admitted into the Sheffield Hallamshire for an operation to remove her ovaries and attempt to remove the remaining Tumour. She underwent this procedure in May of 2009 and her ovaries were successfully removed and as much of the Tumour as possible. Eve faced this scary time with her usual guts and determination and took that positive feeling into the next 6 weeks of recovery followed by 6 months of Chemo therapy in DRI’s Chatsfield Suite. After completing her Chemo therapy treatment just before Christmas, Eve was responding well and went back to her usual life, back to helping others like she’d never been ill. 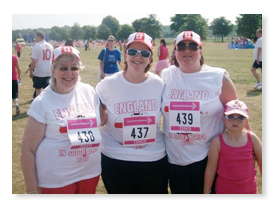 In early July of 2010 she completed Doncaster’s Race For Life on the hottest day of the year, a day when many others were passing out due to heat. Even on this day Eve’s charity messages were not of her own struggle but of others who had suffered with the same disease. Unfortunately on October 5th 2010 and after an ill period that was suspected as a water infection, just 3 months after the Race For Life, Eve was re-diagnosed with Cancer. This time the Tumour was lodged in her pelvis causing damage to her upper / lower bowel and stomach. The specialist painted a picture of non cure and pointed out the options. Being a fighter she opted to attempt a much stronger Chemo Therapy and was booked in the next day, October 6th. Sadly the fast spreading nature of the illness lead to Eve being admitted into DRI on October 11th. Where she would spend the next 2 months. I feel it important to tell brief yet eye opening details of her symptoms to stress the sheer determination and fight of Eve Merton during this time. 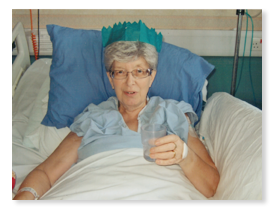 Within the first week of being admitted to DRI her condition worsened to a point that we later found out the tumours damage was eating holes into her stomach but chiefly to her upper and lower bowel. This damage would lead to constant leaking of all human waste and stomach acid. This leaking was not only constantly burning the skin but the sheer nature was particuly confidence shattering for any woman. As you can imagine this was delivering constant pain which lead to numerous different trials of medication and treatment. Despite all of this she would still try to refuse the stronger and more instant morphine pain relief as she didn’t want to appear drowsy to family who were visiting!! 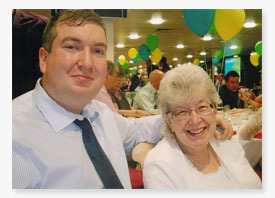 She would still put on a brave face every day, want to know and help with visitors day to day issues and even found the strength to take part in a Hospital bed Christmas party organised by some of the Weight Watchers members and friend Pat Higgins. On finding the news, on the day of her sons birthday, that there was nothing else they could do, Eve was discharged home with homecare from family, district nurses and Hospice at home and did manage to spend a final Christmas and New Year surrounded by family. 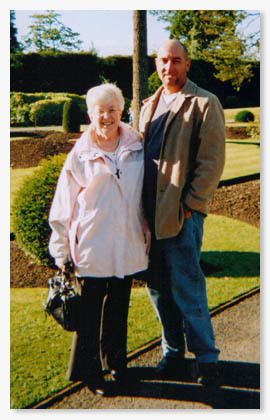 After being admitted for a brief period into The St. Johns Hospice for respite, Eve Merton passed away on the 17th of January 2011 surrounded by her family. Eve Merton was my mum, she was my inspiration, my most loyal friend and my hero. It was my mums greatest dream / wish during her illness to take the walk of the market that she’d done a million times, to see all the stalls, market traders and colleagues that she loved. Unfortunately due to her condition we were unable to make this happen until her final trip within the funeral convoy. 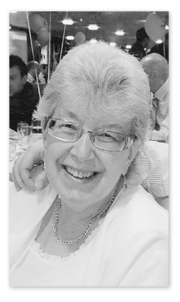 Mum spent her final days thinking of others, giving everything she had and making sure nobody was left out. Even in the last few days, secretly placing money in envelopes in her purse for a sons friends and partner. With this site we aim to help give a Dream / wish or help towards it, for other terminally ill or seriously ill Cancer sufferers in the Doncaster Area. We do this in the name of Eve Merton.